Our slewing ring is an essential and strategic part to ensure the crane light structure. The quality and the precision of our manufacturing is the key to ensure good running after many dismantling operations of the crane, these applications vary in design from single ball, ball roller combination and other combinations. We can supply various type of crane application. Our slew bearings are supplied for ship loaders to load and un-load various commodities. It widely used in ship cranes, harbor cranes, offshore cranes, portal cranes etc. three row roller slewing bearing with dia. 4000mm is very popular in ship unloaders industry. 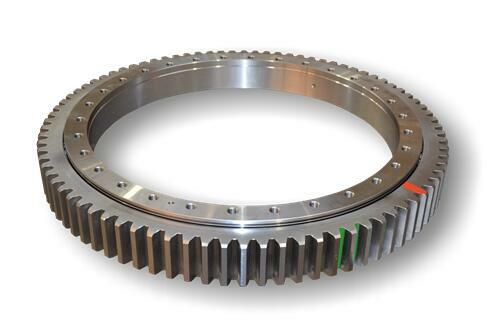 slewing ring bearing for mobile harbor cranes is required to bear very high tilting moment. 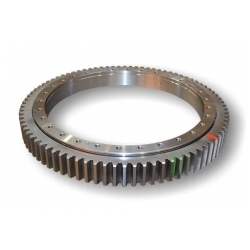 Hence, our three row roller slewing bearing with internal gear or external gear are ideal choice. our slewing bearing for offshore crane is available in different types, to apply for the various requirements of load capacity. the four-point contact ball slewing bearing and three-row roller slewing bearing with internal gear are commonly used. slewing bearing for portal crane is usually classified into the different structure design, like double row ball slewing bearing, Triple roller slewing ring bearing, four point contact ball slewing bearing. Crawler crane is characterized by their tough working conditions, like high temperature and heavy dust, and they are usually the heavy-duty machines requiring slewing bearings of higher load capacity. Our three row roller slewing bearings widely use in these conditions. Stacker reclaimers usually mounted with the slewing bearing of outer dia. over 3000mm, common types including the ball-roller combination slewing bearing, three-row roller slewing bearing, and cross roller slewing bearing.